The Hårkan Tour is our most widely used tour. Partly because the tour offers a fantastic nature experience with mountains, lakes and forests, partly because the lake and river system in Hårkan almost always contain enough water to last all season from May to September. We have several good starting points in Hårkan. Read more about them below. See more pictures from Hårkan here. Two day tour suitable for most people. The starting point is just below Edsforsen at the shelter with dry toilets and (often) firewood provided by the fishing conservation area. The tour passes through mixed forest with mostly pine and spruce. The beaches are rocky and there are shelters located every other kilometer. The ground around these shelters are mostly dry with grass and open areas; this means fewer mosqitoes than in the woods. There are about 15 shelters from Edsforsen down to Lit, the last shelter located at Blåberget, 8 km upstream from the campsite. Start just below Näsaforsen power station where there is a shelter, dry toilet, table and a fireplace. A very suitable place for large groups to camp because the location is a big as half a football field. Here is also a good fishing spot with the chance to catch trout, grayling, whitefish pike & perch. Paddle along the shore in Sandvikssjön until you reach Edsforsen (see above). If you are experiened and the water level is high you can paddle through Edsforsen, but make sure to take the left river channel. Make sure you stop to recon the left river channel before you paddle! If you do not see any stones you can probably paddle if you paddle slower than the current. Do not take the river channel along the road – which is very stony and has a strong current. Alternatives to paddle is to walk with a canoe trolly. It is about 800 meters to walk with the canoe on a gravel road. Start at the east side of Lövsjön, paddle by the shore until you reach Lövsjöströmmen (good trout and grayling fishing). You can almost always paddle these rapids, as long as the water level is not too low. Make sure you paddle slower than the current (paddle backwards). At low water, you may need to lift pass the current, or pass the canoes: walk on the beach with a long rope attached to the canoe bow and stern. Takeoff on the north side of Hotagssjön close to Ålviken (not in Ålviken). Nice start location in a bay where it is rarely windy – an opportunity to stay overnight in tents (no shelter). Paddle along Hotagssjöns south side where it is often much less windy than on the north side. There are no shelters but there are some scenic spots for camping. Avoid the shelter on an island in the middle of the lake! Since the weather is so ever changing you might get stuck on the island for a long time waiting for the winds to change. After about 15 km you will come down to the dam next to Hovdet where the lake ends. This dam regulates the water level in Hårkan. Warning of the outlet at the dam! Keep at least 25 meters away to the outlet so as not to be caught in a swirl and get sucked down. Land at the old outlet – there is a large wooden table with benches for lunch. After this you can choose either of two options: 1) Walk with a canoe trolley straight down towards the stream, about 200 meters, put in and paddle slow in the current to avoid accidents. It can be rocky from time to time. Paddle 600 meters, then land on the left side. There is a 5 meter waterfall here (Kyrkstensfallet) where a few canoeists have managed to paddle down and capsized because of too much water in the canoe. – but beware, there are no warning signs! Or 2) Walk on the dirt road up to the road that goes to Laxviken. Halfway up is a road to the left – go under the road barrier and continue about 2 km, then insert below the waterfall. We recommend the first of the two options depending on your skill level. The stretch between the dam and the waterfall is very nice to fish for trout and grayling. After the waterfall, paddle through Lövsjön to get to Lövsjöströmmen, paddle this rapid or carry the canoe along the stream. Takeoff just below Toskströmmen (pictured). This is a difficult rapid, which should not be paddled unless you are an expert and have the proper white water gear. Nice place to start, with a fireplace but no shelters. Paddle through the gap out to Hotagssjön. On the right side you will see a white church, and if you forgot something you can paddle an extra tour to Rötviken where there is a campsite with cottages and camping. Behind the camping there is a grocery store. It is also possible to start in Rötviken instead of below Toskströmmen. If you instead paddle along the left side after starting below the rapids, follow the left side until Hotagssjön narrows. There you can paddle to the right side. Please note: Don’t cross the lake in strong winds, in such a case remain on your left side until it calms down. Paddle on until you pass the start of the 90 km starting point. The houses you will see are those located in Ålviken. Here there is only one resident family, and some vacation homes. This is the farthest place we recommend starting on the Hårkan Tour. The drop off site is located just below a waterfall of about 5 meters (picture). This is a very nice place with shelter, fireplace and a dry toilet nearby. You may begin by paddling on a small river that is flowing from Bergelia National Park. After about 2 km winding river (where many has seen moose and beaver) you will be out in the lake Ulen (342 meters above sea level). Then you paddle further along the south side where it is generally not as much wind as the north side. Eventually you are going into the lake Rengen, after about 10 km you will cross the border into Sweden. 4 km after you cross the border you will reach a 12-meter waterfall, Rengsfallet. Here you have to carry the canoes (preferably with a trolley) 400 meters and put the canoe in Valsjön. 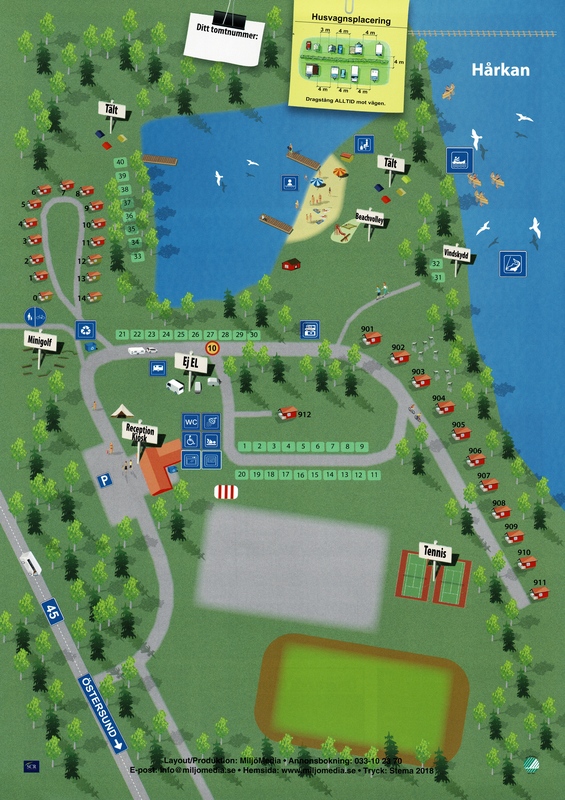 There is a campground with cottages a few hundred meters away. 1 km further down is also an ICA grocery store and a gas station just 50 meters from the water. But if you do not need to replenish your supply of food etc then paddle along the south shore of Valsjön, here is great fishing for trout, char, pike and perch. Best fishing is perhaps just below the waterfall Rengsfallet. Camping is not permitted below the waterfall but it is a good place to stop for lunch. 7 km along Valsjöns south beach (where there are some nice scenic spots for camping), then you arrive at the exit of Valsjön. Either you strand near a sandy beach on the south side or you paddle under the bridge (where, however, there are quite a few rocks). When driving to the start of 150 km, we usually stop to look a little more at how it looks from the bridge. Please note: It is not permitted to fish in Toskströmmen which has a private fishing stretch until below the rapids. Strand on the left side by a stone coffin, do not paddle further since it will be too tough for ordinary Canadians that quickly fills with water due to high waves. To manage this you need proper white water gear and experience. After a few kilometers of walking with the canoe you can put the canoe into the water below the rapids. There is no sign but can’t miss the spot. Then you’ll be at the 110 km starting point. Don’t hesitate to Contact us should you have any questions about the Hårkan Tour!